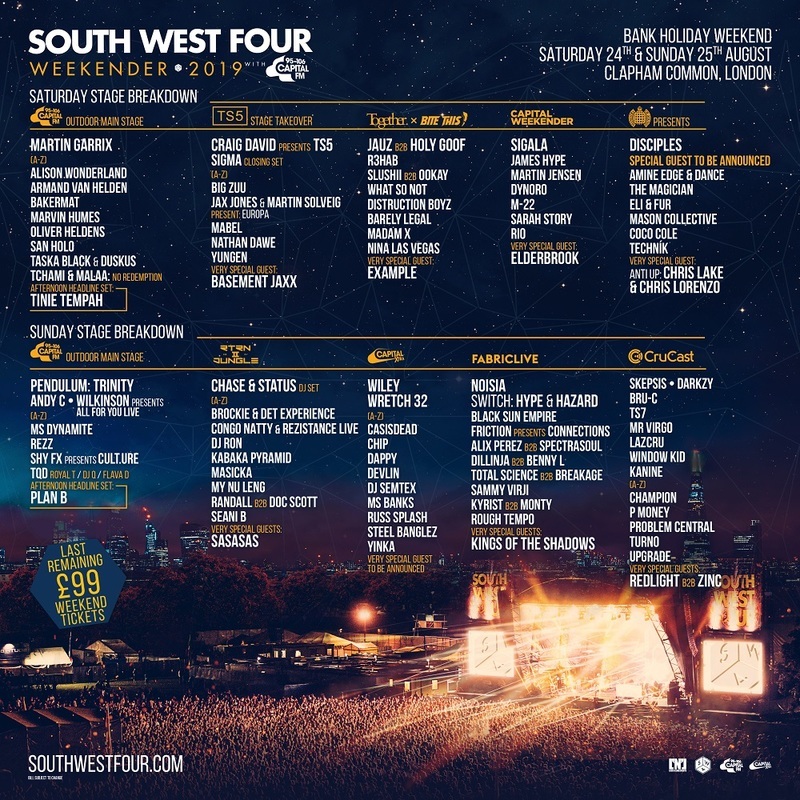 Example, Holy Goof, The Magician and Sigala help complete the line-up for South West Four 2019. The Clapham Common festival returns on Saturday, August 24th and Sunday, August 25th with Elderbrook, Martin Jensen, What So Not, Dynoro, M-22 and Marvin Humes just added to the Saturday and the stage splits revealed for both days. Capital and Capital XTRA will be represented across the weekend. The main stage is headlined by Pendulum with their ‘Trinity Live’ set and Martin Garrix; Capital XTRA will bring a selection of rap and grime favourites to day two such as Wiley, Wretch 32 and Steel Banglez. Grammy nominated singer-songwriter Elderbrook and resident Capital Weekender DJs Sarah Story and Rio Fredrika join Saturday’s Capital Weekender stage schedule. Saturday will see Craig David host a TS5 takeover stage with Big Zuu, Martin Solveig b2b Jax Jones, Mabel, Yungen, Sigma and Basement Jaxx. Together join forces with Jauz and his label ‘Bite This’ to welcome Example, What So Not and a b2b with Holy Goof. Ministry of Sound get their first stage takeover with Disciples, Idris Elba, Chris Lake & Chris Lorenzo’s ‘Anti Up’, Amine Edge & DANCE, The Magician, Eli & Fur, Mason Collective and Coco Cole. Sunday will see Chase & Status return, this time with their RTRN II JUNGLE stage, with Congo Natty & Rezistance, My Nu Leng, SASASAS and Kabaka Pyramid. FABRICLIVE will celebrate their 20th anniversary with Noisia, Alix Perez b2b Spectrasoul, Black Sun Empire and Kings of The Shadows. Bassline champions Crucast will host Redlight, Zinc, P Money, Skepsis and Bru-C.